I came across this great recipe on Lick My Spoon. This is a great recipe because it was easy to follow and the cake came out perfectly on the first try. I don’t know why but I am always surprised when that happens! Also, I have been on this kick lately with coconut, limes and mango. 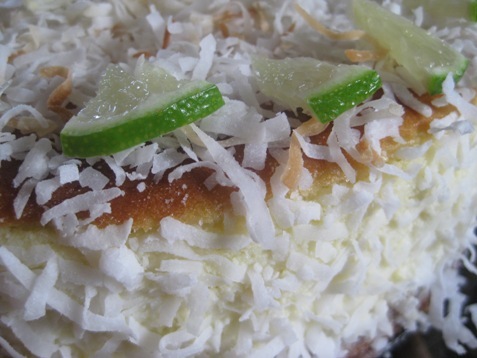 This recipe calls for Key Limes but I used just regular limes and it worked out fine. I’m sure that the unique and delicate taste of Key Limes adds a whole new dimension of flavor but any ripe fragrant fruit is just so beautiful to me. After a long winter, Lime is the flavor I’m craving! I did make a few adjustments. Instead of 1/4 cup Malibu I used 1/4 cup Coco Lopez. 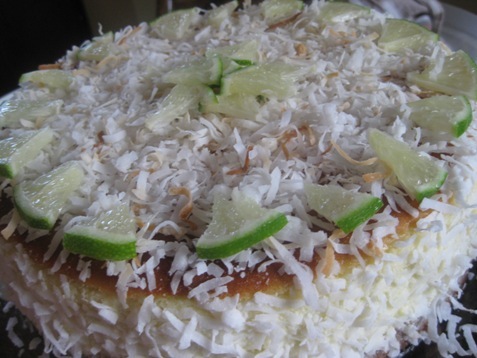 This cake has a very Lime forward flavor, which is lovely, however, I wanted to taste the coconut, as well. 2. Butter or spray the bottom of a 10 inch springform pan with nonstick cooking spray. 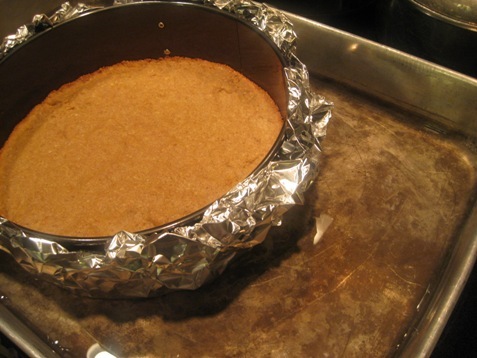 Cover the outside of the pan in foil. Finely grind the graham crackers and cashews in a food processor. Add the melted butter and 1 tablespoon of lemon zest, and process until the crumbs are moistened. Press the crumb mixture over the bottom of the prepared pan. Bake until the crust is golden, about 15 minutes. Cool completely. 3. 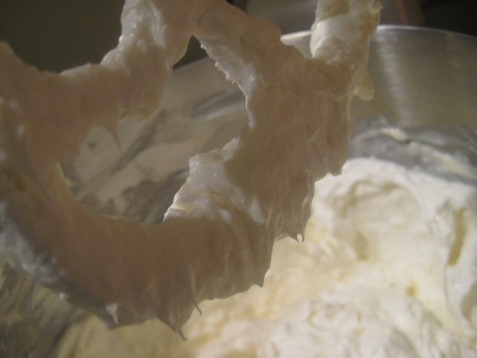 Mix together the sour cream, cream cheese, and sugar. Blend in the lime zest, lime juice, Malibu, and vanilla. Add eggs in one at a time. 4. Pour the cheese mixture over the crust in the pan. Place the pan in a large roasting pan. Create a hot water bath by pouring enough hot water into the roasting pan to come halfway up the sides of the baking pan. Bake until the cheesecake is golden and the center of the cake moves slightly when the pan is gently shaken, about 1 hour. 5. 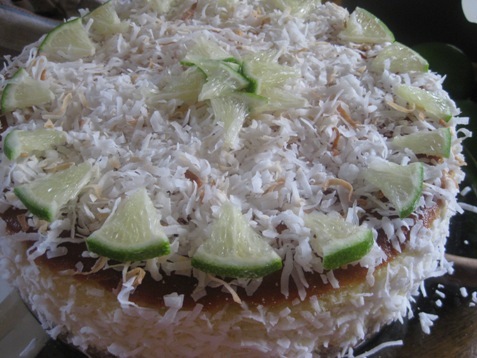 Sprinkle the toasted coconut on top. I just toast the coconut in a dry skillet over medium heat. Keep stirring it so it doesn’t burn; it will toast up quickly. 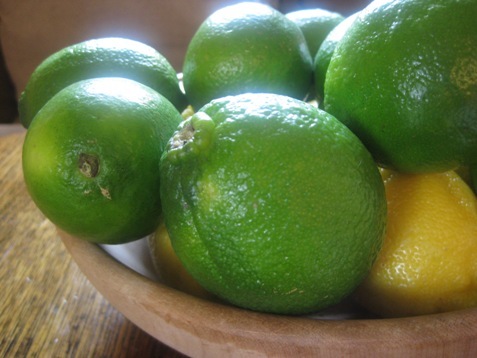 Garnish with lime slices. 6. Transfer the cake to a rack; cool 1 hour. 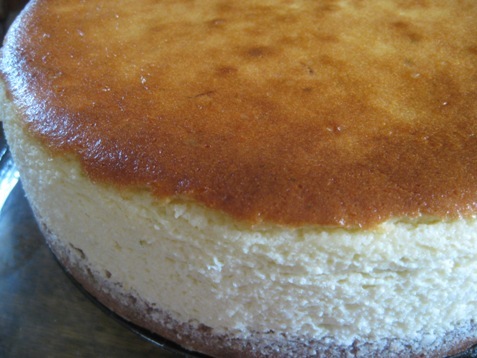 Refrigerate until the cheesecake is cold and firm, at least 8 hours (best overnight). I used my artistic discretion to garnish the cake. These gorgeous limes were my inspiration. 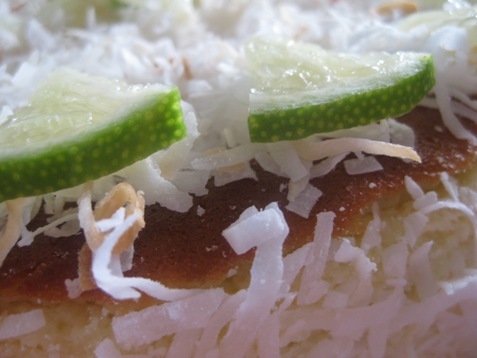 We’ve been eating limes with everything lately! We’ve been making lime juice cocktails and garnishing every meal with limes! The crust calls for lemon zest. The lemon adds just the right amount of flavour. Sugar, cream cheese and vanilla….. 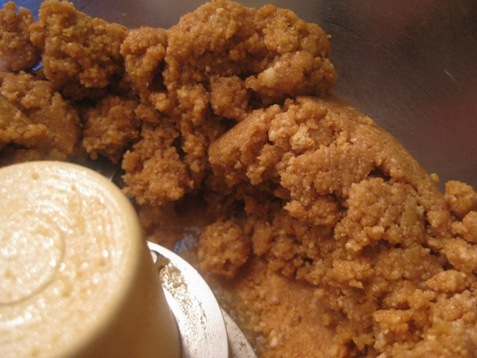 The scent of this crust in the food processor was driving us insane. We wanted to spoon it into our mouths. I am happy that it made it’s way into the springform pan. 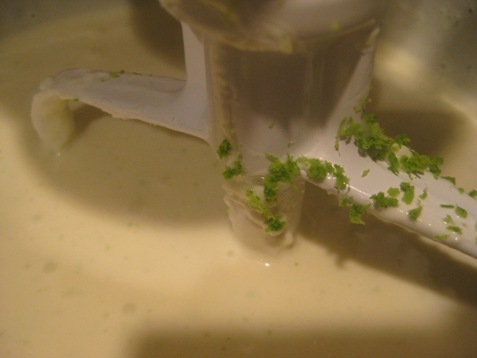 Eggs, sour cream, coco lopez and the lime zest go into the batter. It has a mouth-watering aroma. The water bath is a must to avoid cracks. 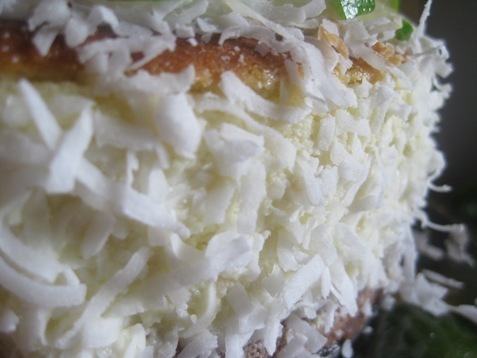 Sweet and crunchy toasted coconut is divine with rich and creamy lime lovliness! And a few more photos of my handy work. I was so happy with the way this cake turned out. I will be making many more of these. 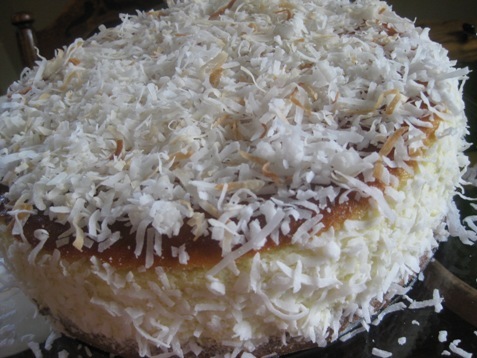 I have the feeling that this will be the Summertime go-to cheese cake for picnics, parties or whatever comes our way! Warm Crab Dip with Yellow Pepper and Green Onion is a Party Favorite!